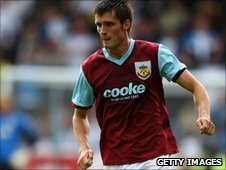 Sheffield United boss Kevin Blackwell has signed former Burnley defender Stephen Jordan on a one-year deal. The 28-year-old, who made 83 appearances during his three years at Turf Moor, was released by the Clarets after their Premier League relegation. Jordan had spent part of the summer in the United States with Portsmouth. "He's an option at left-back who played 26 times for Burnley last year, and 26 times the year before - he's solid," Blackwell told BBC Radio Sheffield. The Blades boss added that he hoped several injured players would return to the squad over the next fortnight, and confirmed that he was looking at a further signing. "I'm hoping that Carl Bartlett will be coming in this week, and Nyron Nosworthy will also hopefully get fit," Blackwell said. "All in all over the next two weeks we'll have two or three good players back, and I'll still look to get another one in if I can." Jordan started his career in the youth ranks at Manchester City, but made his league debut during a loan spell at Cambridge United. He went on to make 62 appearances for City during a seven-year spell, before moving to Turf Moor in 2007.